If you have trouble going to sleep at night, staying asleep during the night, or perhaps even both, then this will help. 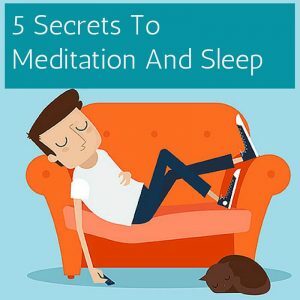 The most important advice I ever received on meditation and sleep was that I needed to get my mind and body back into a sleep routine. So what exactly is a sleep routine? It’s the habitual way that you prepare yourself to go to sleep whether that’s at night or during the day if you are a shift worker. The more you can get into a routine of when and how you go to bed the better quality of sleep you will get. Meditation helps you to sleep by slowing down your mind so that the body can prepare for sleep. All too often our minds can still be busy at night because of being physical, mentally and emotionally stressed during the day. Then there’s also those times when you can’t stop thinking about something that happened is coming up in the near future. These are the times when you go to bed and find yourself tossing and turning, or staring endlessly at the ceiling with no sign that sleep is going to come anytime soon. Meditation helps to reduce the busyness of the mind and helps your mind slow down and body to relax so it makes it easier for you to sleep. While studies have shown that mindfulness meditation can help with sleep patterns, it’s also helpful to take steps to improve your sleep habits. This means working on the environmental factors that can also contribute to making it difficult to fall asleep or stay asleep. 1. Go to bed at the same time every day. I know this may not always be possible given that so many of us lead such hectic lives these days but if you can make a habit of when you go to bed and stick to it as best you can, then this helps your internal body clock to trigger your sleep hormones. If you set a goal to be in bed by 9pm, then do your best to stick to it. 2. Eat foods that produce serotonin to help induce sleep. Serotonin is a hormone that influences our sleep patterns and when this is low in our body, then it can prevent you from relaxing enough to fall asleep. Some of the foods that help to increase serotonin naturally include sweet potatoes, root vegetables, non-wheat based grains like oatmeal and rice, dark chocolate, green tea, and fermented foods. 3. Avoid stimulants before bed. Things like alcohol, caffeine, and sugar-based drinks should be avoided up to 4 hours before your planned bedtime. These can very disruptive to your sleep cycles as they mess with your brains ability to produce the necessary hormones to get ready for sleep. 4. Give your brain a rest at least 1 hour before bed. Whether it’s watching TV, scrolling through your social media accounts, reading a book, or being plugged-in to some kind of mental activity, get unplugged an hour before you go to bed. This gives your mind and brain time to settle down and prepare for sleep. You can use this time to have a warm bath by candlelight, or even meditate by being mindful of your breath or thoughts before you go to bed. 5. Make your bedroom a sleep sanctuary. This means no bright lights, TV’s, stereo’s, exercise equipment, or anything else that can distract you from sleep. It also helps to keep your bedroom as dark as possible and quiet as possible – so no phones is a good idea. Think of it this way, anything that can disturb your sleep or energize you in any way will not help your sleep cycles. 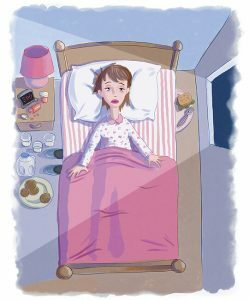 Getting a good night’s sleep is imperative these days as we have so many distractions and things to deal with that our energy is constantly being pirated. If you don’t make sleep a priority then you will ultimately feel run down which will make everything you do seem to take much more effort than would typically be needed. Long-term sleep deprivation can lead to all sorts of mental and physical health issues as well as put your body under extra stress each day as it didn’t have the chance to de-stress during its natural sleep cycle. This is why so many people wake up feeling just as exhausted as they went to bed. By developing a good sleep habit you are not only setting up your mind and body for optimal health and well-being, you are also giving yourself the gift of proper rest and recovery from the never-ending onslaught of daily events.